Back in 150 CE a geographer with Greek descent called Ptolemy, in his own language made reference to a snow-capped mountain in the heart of Africa as the mountains of the moon. Over a century ago, in the late 1880’s, a modern European explorer, Henry Morton Stanley embarked on a mission to explore an unknown. Nobody is certain whether Stanley was trying to discover the mountains which Ptolemy had made reference to, but the massif he saw, to him deserved the name “Mountains of the Moon”. And coincidentally, it was situated in the heart of Africa; or in other words the “Pearl of Africa”. Today the same massif that Stanley saw has the name Rwenzori but maintains the tagline “Mountains of the Moon” because it deserves it. The same mountain has not lost the abundance of life and beauty on which Stanley was forced to make his exclamation over 125 years ago and it can be visited while on Safaris and Tours in Uganda. Rwenzori (16,761 feet), which is actually Africa’s highest mountain after Mount Kilimanjaro and Mount Kenya, just seems to get better, and every hike is unique in its own way. 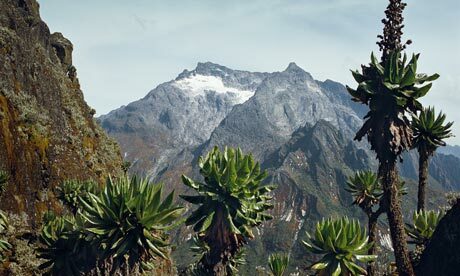 At the higher points of the massif, we find one of Uganda’s newer National parks, the Rwenzori mountains National Park. I am forced to say that what took very long for the Rwenzoris to be gazetted as a national park (1991) and a UNESCO World Heritage Site (1994) was because its beauty had struck many of us into complete paralysis; the kind of gorgeousness that would have one’s jaws dropping open in complete amazement. Today Uganda Safaris and Tours lead to this massif (situated in south-western Uganda) where visitors can meet many fauna species like the leopards, four primate species including our closes relatives the chimpanzees and the elephants. The park is also an Important Birding Area with over 217 bird species including the Rwenzori Turaco and Crimsonwings. A Uganda mountain Climbing Safari and Tours in the Rwenzoris presents interesting botanical drama. Like a finely wrapped present, the massif opens up new vegetation types the higher someone climbs giving you a stronger reason to keep going higher so as to discover what the next level has to unveil. Many of these flora species will only be found in some East African highlands above 3,800m including the “Botanical Big Game”. Like wine, the area gets better with every day that passes by and is ever on guard with a different type of beauty for every visitor’s eye. It will be very hard for you to find another place to enjoy snow adjacent to the equator; enjoy cultural encounters with the Bakonjo; see incredible animals, birds and plants; and to take a photo of yourself in paradise. A Uganda Safari to the Rwenzoris is the full package. After those seven (7) days and six (6) nights of hiking, when you reach the summit you will be proud to add a voice to Stanley’s 19th century exclamation that the Rwenzori Mountains are indeed the “Mountains of the Moon”.